Leave the flat world behind and address three dimensions at once! Add or subtract. Build, carve, mold, cast, model, digitize and join in reaching your hands out to embrace a material, suggest a condition, test a hypothesis. 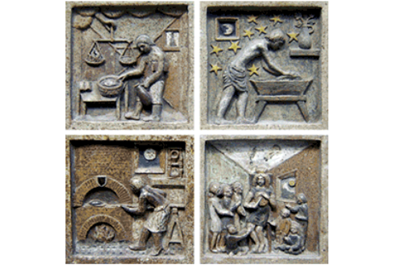 Since the beginning of time, people have made things with their hands to represent or simulate ideas. Working in three dimensions - height, width, and depth - and with hard or soft (malleable), physical or digital material, the artificial world can be explored and constructed. People use local materials, found materials, raw materials and virtual materials to create new things to look at and to use. Modeling is a technique in which soft material such as clay or wax or mud or wet sand is shaped into a new form. Today there are many types of models used to represent proposed projects or situations, explain or predict behavior of objects or phenomena, raise questions, communicate ideas and test hypotheses. 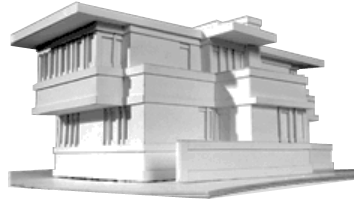 Artists, scientists, and designers use physical models, conceptual models, mathematical models and computer simulation models to learn. Leave the flat world behind!!! Select a soft material such as a bar of soap, soft white bread, foam, a plaster block, etc. You will need a piece of paper and pencil, a paper plate (for soap shavings), a woodcraft stick (and/or tooth picks and/or a knife and fork) for carving. Take the piece of paper and sketch out an idea for a sculpture. Draw a large image almost touching the edges of the paper. Then fold the paper in half and half again. Open your bar of soap. First scrape off the name of the soap using your carving tools. Mark the soap in four quadrants. Next transfer your drawing in four quadrants onto the bar of soap. Start scraping away from the surface of the soap. You are creating a relief sculpture. Find a shoe box or piece of stiff cardboard to support your sculpture while you are making it. 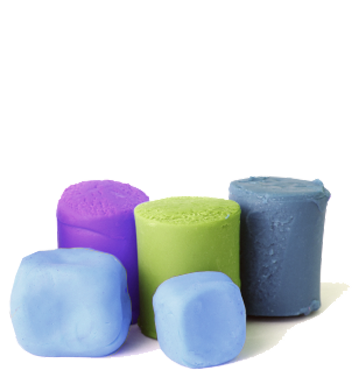 Select a soft malleable material such as wax, modeling clay or wet sand. A malleable material that is good for modeling should have good ‘plasticity’. Plasticity is the ability of the material to mold into a shape and hold that shape while at the same time maintaining its elasticity (pulled and stretched without breaking). Use your fingers to pinch and poke the material into any shape. Using a rolling pin, roll the clay into a flat sheet and cut out any shape you want. Roll clay into a snake-like coil and twist it, braid it or stack it. Do not let clay go into the sink as it will clog it. Because clay is from the earth, return your unused clay back to its container or put it back out in the garden outside. Model objects that you use daily, like a comb, toothbrush or cup. Then make a model of a new tool or object that you could use. Some models are built by fitting precise pieces together in order. To cut pieces precisely, one needs to use sharp scissors or a mat knife. Great care must be taken when holding the paper to make the delicate cuts. When using a matt knife, also use a cutting board (cardboard or gridded plastic) below your model and a cork-backed metal ruler. Print the model of Falling Water or the Statue of Liberty or choose a model to make at http://papertoys.com. Cutting paper was just the beginning. People build all kinds of models out of all kinds of materials. You can use watercolor paper, cardboard, chipboard or thick types of boards to create a base and begin your model. Modeling clay is a good material for organic or irregular shapes. Foam can be sanded into soft forms; wood can be soaked in water and bent. You can fold, stretch, stitch, weave, form, join! Collect some materials and explore the way forms can evolve or materials can be joined. Explore soft and hard materials, cut and formed materials. Experiment with material combinations. 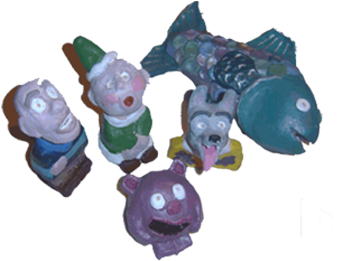 The flat screen of the computer along with the mouse and keyboard allow us to create three dimensional volumes and shapes. We can rotate constructions, add sun angles and natural lighting effects, map colors, materials, objects and even people. We can create walk-through animations or even construction animations recording or process. We can model in detail and then pan out to get a view of the overall form. Experiment making shapes and forms in Google Sketch Up. Use the rotate tool and hand tool to move your model around. Using the select tool add colors and materials. Using the sun tool set the sun in the sky and turn on a time of day! Practice making three-dimensional forms online. People are creating new tools that shift the way we can work. Watch this TEDed Video about new ways of working. Master the digital realm and imagine new ways to capture and construct your ideas! Modeling is only a 3-dimensional craft. People model different materials in many ways. Any material can be used for sculpture. Nature is natural, not artificial. Taking away from a form is called subtractive.